When I built my house I laid underfloor heating pipes, these have never been used. We had been feeling a little cool in our unheated lounge when it gets very cold outside and when my mother-in- law comes to visit my wife had been putting on a small convector heater as she is in her eighties. The room is generally 20°C but for older people this seems cool cant say I had a problem with it myself. 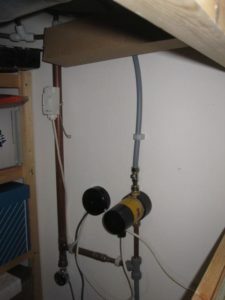 So I thought about somehow connecting up the pipes to a heat source but what boiler is there with an output of Watts rather than Kilowatts? Eventually I decided to use one of those elements that are used in towel warmers, a 125W one, and install it into a copper tube with a tiny pump and a thermostat all mounted on the wall in my basement. It seems to work OK raising the floor temperature a tiny bit 0.5°C but the room by a full degree and with three of us in there adding more heat the room it can touch 22°C. This makes enough of a difference to keep everyone happy and in the very cold November of 2012 it was using only 65W on average. Probably it will use more if we get a cold winter like the last two but I am hoping that it will still cope. I have it hooked up via an energy use monitor and am recording how much it uses. My snooker and exercise room which is immediately below the lounge is noticeably warmer when the system is running. above the pump, connected that added a tiny bit of pressure and switched on gingerly. The electrics are plugged into a 13A socket with a 5A fuse to circumnavigate part P regs.